Toyota Parts | Gibbs Sports BMW Powered QuadSki - Go Anywhere, FAST! Gibbs Sports BMW Powered QuadSki - Go Anywhere, FAST! Adrenaline junkies who enjoy riding ATVs and jet skis will be fascinated by the latest development from Gibbs Sports Amphibians. Those outdoor enthusiasts will no longer be forced to choose between buying an ATV or a jet ski. That’s because Gibbs has designed a revolutionary product that combines the excitement of each into one machine: the Gibbs Quadski Amphibious ATV. The Gibbs Quadski is an amphibious ATV…or maybe a JetSki with four wheels? What Is The Quadski Amphibious ATV? This 175-horsepower amphibian has the ability to traverse some of the roughest land in the country in one moment, and then to speed across lakes and seas in the next. Upon first glance, the Quadski appears to be an ordinary ATV. However, it is powered with two servomotors that can pull in the wheels, converting it into a jet ski in only five seconds. How Fast Can It Travel? The Quadski can travel at speeds of 45 mph on land and on sea. While there are other amphibian machines on the market, none of them are able to travel at speeds greater than 10 miles per hour in the water. The Quadski can hit 45mph on land or on water – not too shabby. Warning: It’s expensive. The cost of each unit is projected to be around $40,000. Gibbs does has plans, however, to develop three new models of amphibians in the future which may provide consumers with some lower cost options. The dry weight of this machine (excluding the passenger, fuel, and equipment) is 1,180 pounds. It’s made for only one passenger and has a payload of 260 pounds. It is powered by a 4-cylinder, 1300cc engine and is set up on a rear-wheel-drive layout. It is 10.5 feet long, 5.2 feet wide, and 4.6 feet high, with a wheelbase of 5.9 feet and has 9 inches of ground clearance. Who Is It Marketed Towards? With a price tag of $40,000, this unit may not have wide appeal at the onset. Only the most committed sportsmen — and luxury travelers — will likely purchase one of these units. However, as the new models develop, and if Gibbs can get the prices down to a range that is comparable with other ATV and jet ski units, this product should have a wide appeal. 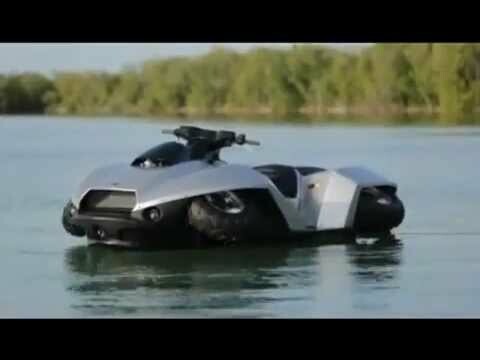 This is a unique amphibious vehicle that offers riders benefits that are unmatched by any other land or water vehicles, making it an instant hit. You can find them at your local dealer or for a list of dealers, check out GibbsSports.com.